The season so far has been something of a struggle. The below report provides a statistical breakdown of our stats including player stats on passing, pressing and finishing, along with some conclusions which can be gleamed from the data. Generally I would say that Moyes does tweak his tactics dependent on the opposition. I would certainly give him credit on the road for some of his strategic defensive decisions. For example, deploying Heitinga as a man marker on Van Der Vaart v Spurs and Coleman at Chelsea/Spurs on Cole/Bale. Moyes has shown he is an astute tactician when looking to minimize the capability of opponent’s key players. This is reflected in the better results this season which have been on the road with draws at Spurs and Chelsea as well as being the first side to beat Birmingham at St Andrews in a year. At home though, the tactics have been predictable. In playing two natural defenders in midfield with Heitinga and Coleman, there is a real lack of adventure. Arteta is the player we look to get things moving and is often the source to feed the more offensive left side. Whilst his form hasn’t been good it needs to be noted that other teams have clued up to our creative reliance on him and notably press him more than for instance Heitinga when in possession. We are guilty of not evolving our tactics certainly from an attacking sense. The World Cup showed if anyone still doubted it that 4-4-2 is an outdated approach and although many supporters would be happy to see us play a more orthodox 4-4-2, I would see this as a backward step. In the World Cup Germany played a 4-2-3-1 system while Spain play a 4-3-3 in a Dutch/Barca style. In the case of Germany they have Podolski, Ozil and Muller playing as the advanced 3 players behind the striker Klose. These 3 players represent the modern continental footballer in that they have the ability to play across the 3 positions, are fluid and interchangeable. Getting the most out of players and making astute signings have been 2 hallmarks of the Moyes reign. This season however, I would question his ability to get the most out of certain members of his squad. Two of the high profile signings in the last campaign, Billy and Heitinga, are examples. Heitinga’s role in midfield makes no sense to me, especially in home games. He is a player who doesn’t particularly press well as shown by his stats in Diagram F, although he is a good marker as he showed last season against Drogba & Rooney at Goodison. He makes no impact at all from an offensive point of view. Diagram C shows this in the Stoke game where Everton dominated possession (66%) yet the Dutchman only made one pass into the Stoke 18 yard box. The signing of Billy is looking dubious. He was undoubtedly recruited because of his flexibility and capability to play as a ghost winger or centrally between the lines of midfield and attack. 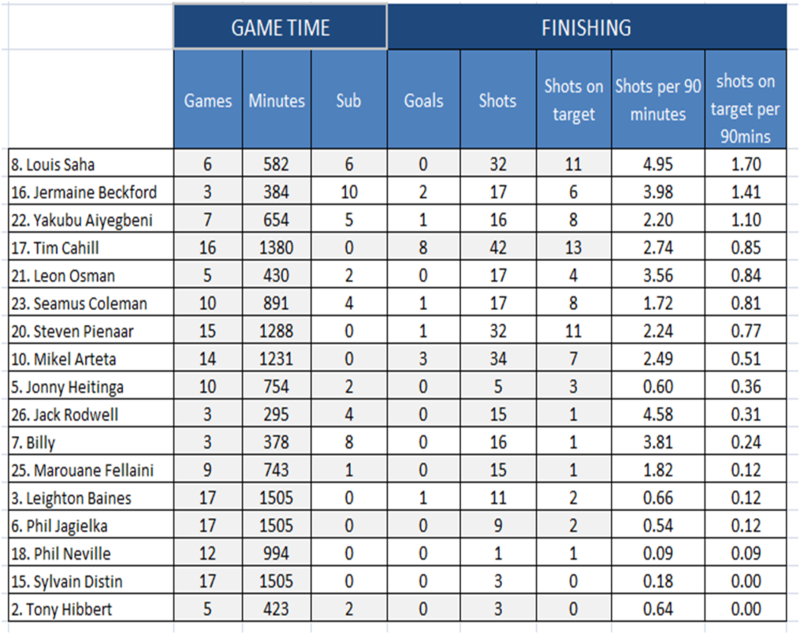 However, despite a decent goals return last campaign he has spent the bulk of the season warming the bench. If Moyes wishes to play the ghost winger approach then Billy really needs to click. Our problems up front are well documented but we also have issues in midfield. As discussed in point 1, Coleman’s best displays have come on man marking assignments. Offensively against Blackpool and Arsenal he was superb but at times he has struggled and been out muscled by more Premiership savvy fullbacks. Our lack of pace in the team in general means that Coleman is a must to start for this outlet he gives us. 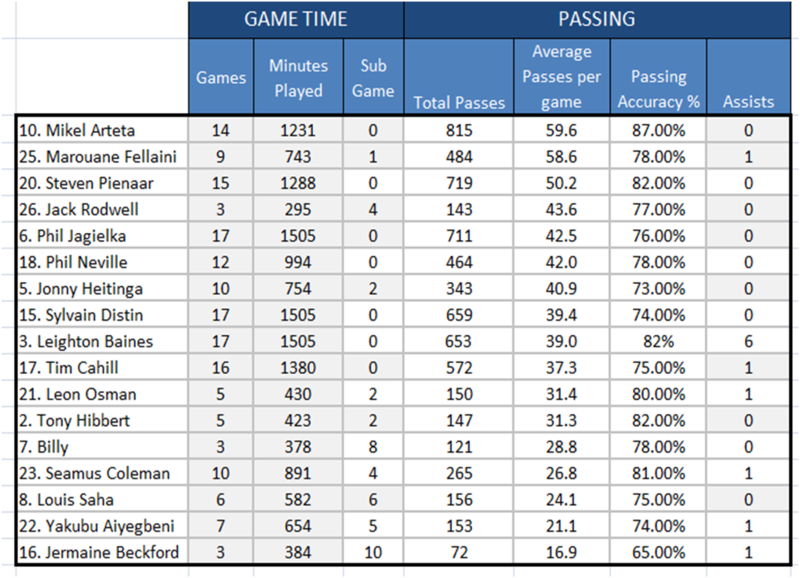 With just 2 assists between Coleman, Heitinga and Fellaini, it puts a massive creative burden on Arteta and Pienaar. Between the 5 players there are a total of 4 goals and 2 assists. Compare this to the Spurs midfield of Bale, Van Der Vaart, Lennon and Modric who have 13 goals and 10 assists between them. Often the blues midfield has looked unbalanced with Arteta alongside Heitinga in the centre. Everton’s left side is strong going forward but is often targeted by opposition managers as a weakness . Heitinga is often deployed on the right of centre, meaning Arteta has a greater defensive responsibility on the left covering for our more offensive left side axis. This is shown in Diagram D above. Hopefully Fellaini’s return to the side should remedy this. Cahill is often deployed as an out and out striker in a 4-4-2, playing the role of target man in a way previously done by Duncan Ferguson. With Cahill playing as a striker this gives us 13 goals (including Cahill, Yakubu & Beckford goals) which are more than Tottenham and Arsenal’s strikers have registered this season. In the last 2 campaigns Saha (13) and Cahill (8)have finished as top scorer for the Blues. There is a general trend for attacking goal threats from midfield and the decline of the 20 goal a season striker. With this in mind, our goal scoring issues do not lie solely with the strikers. Often our forward 5 players will sit back and allow the opposition defensive players time on the ball, with Cahill the notable exception to this. The one game where the Blues did adopt a more aggressive tactic was in the Derby which led to more interceptions in the opponents half than any other game this campaign. Baines is statistically Everton’s best defender, averaging 2.99 tackles per game, which is probably the result of opposition manager targeting our left side. Jagielka is Everton’s best tackler, making 32 successful interceptions this campaign. 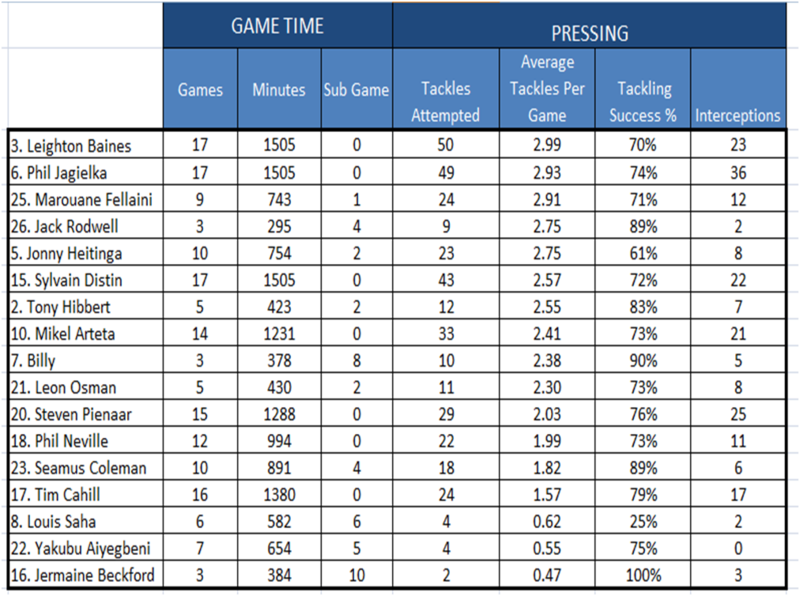 On average there are 65 tackles in our games with 37 tackles being won and 28 lost. I used to tell my players that, if we played with twenty-five metres from the last defender to the centre-forward, given our ability, nobody could beat us. And thus, the team had to move as a unit up and down the pitch, and also from left to right. This tactic is especially effective against teams and players who have a poor touch and therefore not able to pass and move the ball around the reduced space. It is certainly an area we need to improve in the second half of the season. One of the few plus points of the season has been the emergence of Seamus Coleman in the senior squad. As the stats below show his tackling completion is of the highest order, a hall mark of a born and bred fullback. His displays as a man marker on Ashley Cole and Gareth Bale where top draw and on both occasions he nullified these considerable threats. Diagram G illustrates this well. He offers pace, trickery and penetration as an attacking wide man also, although his decision making and final ball is often patchy but this is to be expected of a young man learning his trade in a different position. Our most creative outlet is without doubt the left side. Baines delivery, the movement inside of Pienaar to create the space and the aerial prowess of Cahill are a lethal combination. The left side has been the source of 72% of our goals this season. Baines is very much the modern day full back, pace, a great engine to get forward and consistently producing an exceptional standard of crossing. Diagram I shows this well rehearsed move nicely. However, opposition managers are well aware of out left side and its defensive deficiency. 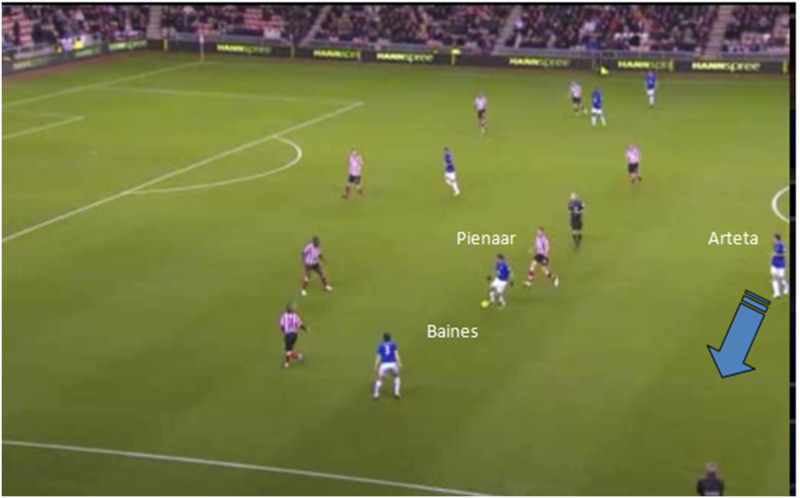 Pienaar if often guilty of positional naivety and not giving Baines adequate protection. Opponents have targeted this area numerous times this season and overloaded down our left side. 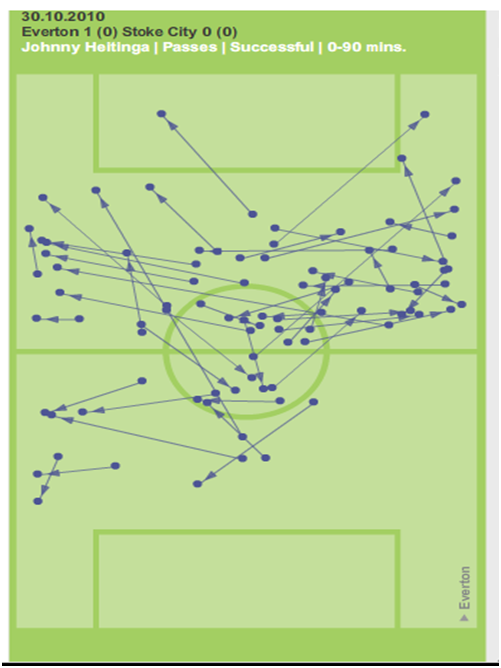 For instance, Arsenal focused 44% of their passes down our left side. In total 60% of the goals we have shipped this season have come from our left side. We have certainly evolved from the team of say 2005/5 when the emphasis was more on a high tempo, pressing game in a more rigid 4-1-4-1. The personnel have certainly evolved with players sourced for their ability to fit into the ghost winger strategy. For example, Pienaar is somebody who has positional fluidity and can cut in and play across the midfield as opposed to his predecessor Kilbane who would stick rigidly to his position on the touchline. 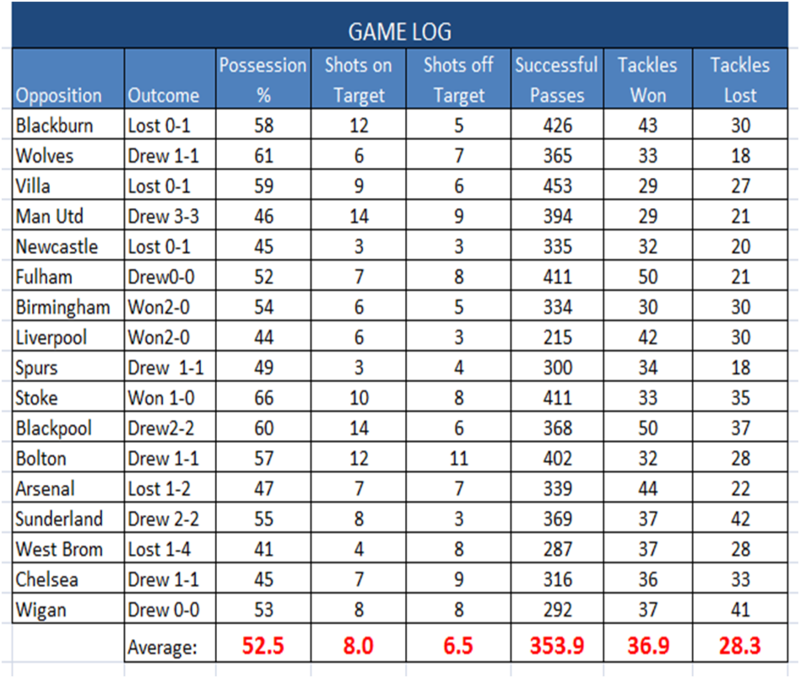 Diagram A shows our average passes completion per game is 354, well above the Premier League average. Arteta averages the most passes per game (59) and also boasts the best completion rate with 87% of his passes delivered to a team mate. Since the departure of Andy Johnson we have lacked the kind of blistering pace which upsets defenders and enables teams to stretch the play. Currently in the team Beckford, Coleman & Baines would be regarded as our faster players but only Baines would be classed as a regular starter and is a defender. Therefore, teams can come and play against us with a high line, pressing in our own half safe in the knowledge that we don’t have the pace to get in behind them. 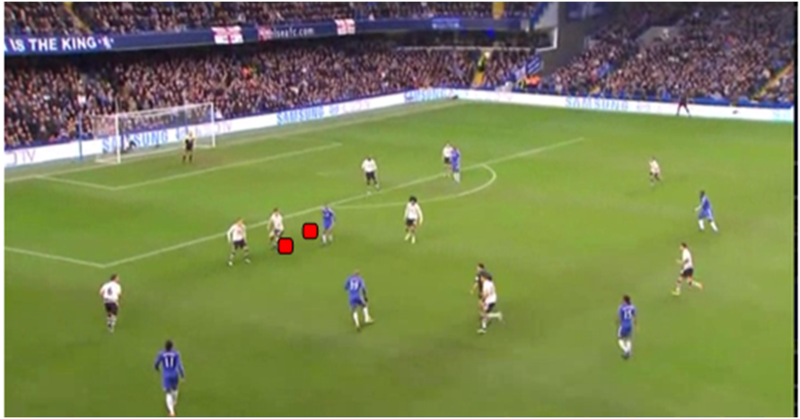 It was the opposite when Johnson was with us when teams would defend deep to deny the space in behind. In the last 3 seasons teams have come to Goodison to get a point, have sat back and defended in numbers. This season there has been more of a tendency for opponents to press us higher up the pitch, commit more numbers in advanced areas and go for the 3 points, an example of this was the Newcastle game. This is a risk opposing managers take and is mitigated by the fact that we have a gaping lack of pace in advanced areas so capitalising on the opposition should we catch them in possession in our half is unlikely to result in a rapid counter attack goal. This entry was tagged Baines, Coleman, Left Side, Pace, Pressing, Tactics. Bookmark the permalink.